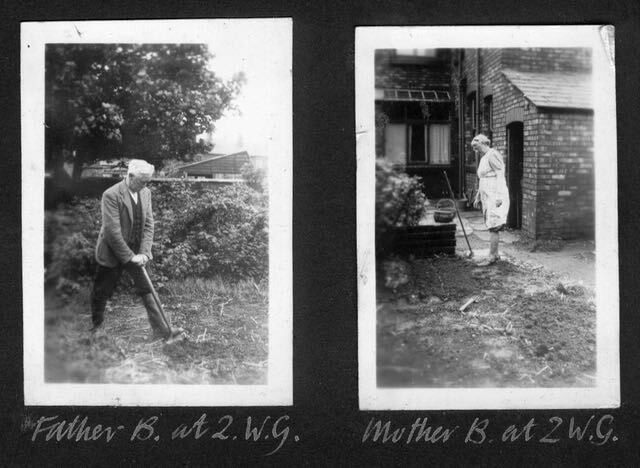 Our dad’s parents in the garden, captioned in our father’s lovely handwriting. 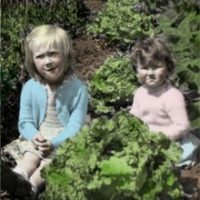 Why do you garden? In our family, it’s something you just do – eventually, you become a gardener. For my sister Sarah and I, it’s now as ingrained as family jokes, traditions or recipes. We grew up with parents and grandparents who had their hands in the dirt. Many generations of them. 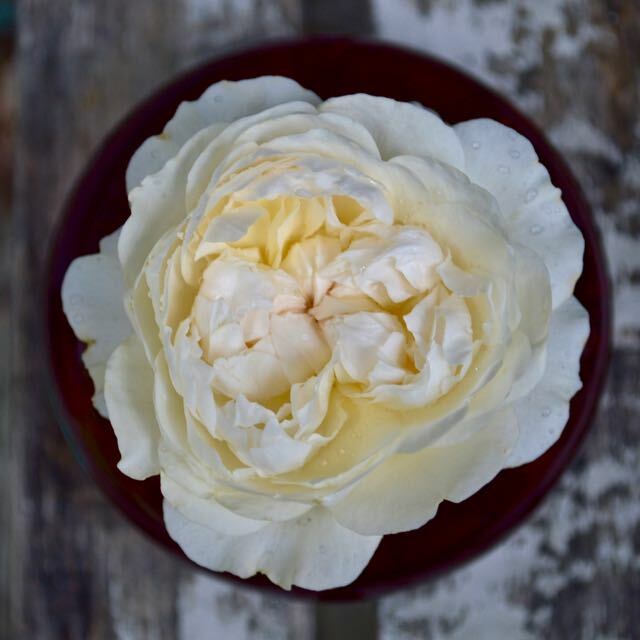 A while back, for example, Sarah wrote about our mum’s mum, the prize-winning flower gardener. She was only a generation or two removed from the farm, in Shropshire on one side and the Isle of Man on the other. And I’ve written about the influence of our mother and also our “urban chicken farming” parents in the Cotswolds farmhouse where we lived before we came to Canada. But I’ve not yet written about our dad, who taught me, among other things, the most efficient way to dig, how to chit potatoes, and how to start a compost pile – and who died 22 years ago today, on November 11, 1993. For me, Remembrance Day always includes memories of our father. His folks, Father and Mother Battersby, pictured at the top, didn’t have a huge estate, as you can see. But what they had, they gardened – useful stuff like gooseberry bushes, raspberry canes, and vegetables. Our Grandfather Battersby was a master plumber at a sewage works near Manchester. Apparently, the sludge fields were a great spot for volunteer tomato plants, or so our dad told me. Our parents had the nomadic spirit, and moved us around a lot as kids. We didn’t always live with both parents. 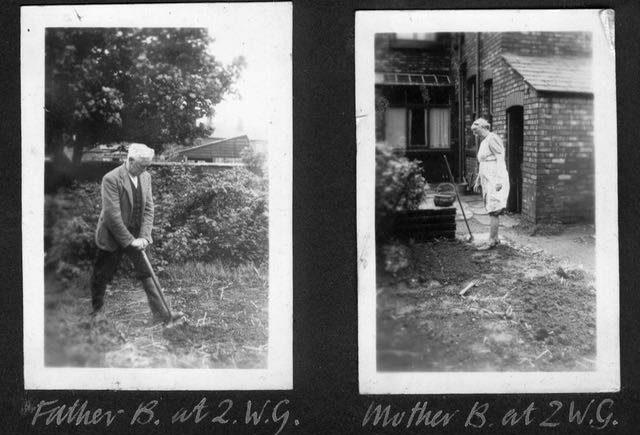 But, twice, we lived as a family somewhere with land enough to put in vegetables – and our dad to do the digging. Those vegetable gardens were huge. Enormous. Heroically large. And they thrived. Dad was sometimes a troubled man, but he knew how to make things grow. It’s thanks to him that I know how sweet fresh peas can be, right off the vine, or baby carrots, with the dirt rubbed off on your trousers. He produced those mammoth lettuces over there with Sarah and I. And that’s him, below, checking on the sweetpeas. Thanks, Dad. I miss you. Whenever I harpoon the roots in my rooty soil, I think of the man who taught me to let the weight of the spade do most of the work. I’ve passed that on to his grandchildren. had their beginings with my greatgrand mother,well it is fun. My sister and I each keep geraniums that remind us of ones our mum used to have. It would be amazing to have one in the family as long as great-grandmother days! Thank you, Kathryn, and thanks for dropping by. Thank you for this. I'm going through a difficult time with my parents right now. My Dad in particular. This lovely post reminds me that even difficult parents have gifts to bestow. 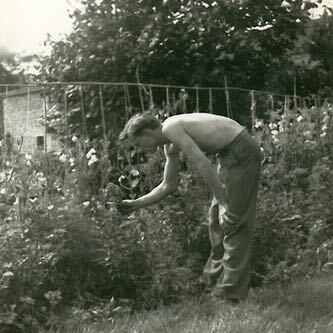 My Dad is not gardener but it's accepted wisdom in our family that I got Grandma Olsen's – that's my Dad's Mom, a tough as nails German woman – gardening genes. Not a square inch in her small garden in Vancouver went to waste. Food, flowers, and – her pride and joy – award winning dahlias. I'm pretty sure when my Dad sees my garden he is reminded of his garden-loving Mom. Long gone.